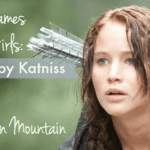 What, exactly, are ecovintage girl names? They sit at the intersection of two irresistible baby name trends: they’re nature names, tied to the outdoors. But they’re also vintage in style. They’ll appeal to some parents who love Willow and Skye, and others who favor Evelyn and Amelia. I coined the term in a list for nameberry a few years ago, and have been thinking about expanding it ever since. Have a clear and unambiguous meaning, direct from the natural world – though it’s okay if that meaning isn’t immediately obvious. Appear in the US Top 1000 prior to 1918, and feel like it might have been reasonably heard as a given name a century ago. A handful of names, like Willow and Eden, feel like they qualify – but they just miss the mark. 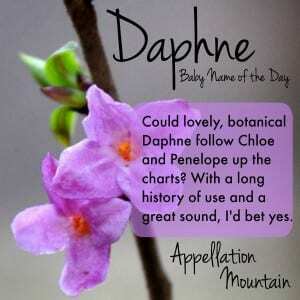 If you love nature names, but want something with a long history of use, ecovintage girl names might be exactly the list you need. Anyone who has heard the folk song knows that Clementine’s got history galore. “Oh My Darling! Clementine” dates to 1884, but has older roots still. Winston Churchill’s wife was born Clementine Ogilvy Hozier in 1885. It comes from a Latin word meaning mild; Clement has centuries of history as a masculine given name. Clementine makes the ecovintage girl names list thanks to the small citrus fruit that shares the name. The story goes that the hybrid was first cultivated by Father Clement Rodier in the garden of the orphanage he ran in Algeria circa 1900. Read more about Clementine here. Cicely – this spelling – is cousin to parsley, an edible name with a sweetly vintage vibe. Cecily, of course, was heard in the Middle Ages as the usual form of Cecilia; today, Cecilia charts in the US Top 1000 while many of the related names languish in obscurity. Every bit as edible as Apple, Cicely feels far more restrained – but every bit as rare. I’ve yet to write about Cicely, but check back and I’ll update when I do. A sweet spot name for a daughter, Daisy combines casual style with plenty of history. Henry James’ Daisy Miller makes it literary; it also reminds us that Daisy charted in the Top 100 back in the nineteenth century. Read more about Daisy here. If you’re of a certain age, Daphne is all the red-headed, purple-frocked heroine of Scooby Doo fame. But look beyond the animated character, and Daphne comes straight out of Greek myth, a nymph pursued by Apollo. She escaped him by appealing to the gods, who transformed her into a laurel tree – which is Daphne’s ecovintage meaning. It fits right in with Top 100 favorites, like Penelope and Chloe, but remains far less popular. Read more about Daphne here. Sure, Estelle Getty played one of The Golden Girls. But their names are back – in a big way! Hello, Sophia, Dorothy, and Rose. So why not Estelle? Every bit as French as Genevieve and Josephine, with a lovely nature name meaning: star. If you’re looking for something celestial and literary, add an ‘a’ to arrive at Great Expectations‘ Estella. Read more about Estelle here. Speaking of stars, Biblical Esther likely comes from a Persian word with the same meaning. The Old Testament heroine has inspired parents for ages; it’s never left the US Top 500, and has often appeared in the Top 100. Madonna recently adopted a daughter with this name; her twin is Stella. Gentle Fern was a Top 200 name at the turn of the twentieth century, but it’s faded since, leaving the Top 1000 entirely after 1961. Despite this long run of obscurity, everyone recognizes the nature name. Plus, the little girl at the center of Charlotte’s Web answers to Fern Arable, and she’s memorable. Unlike all the other humans in the story, she seems to understand Wilbur and Charlotte. Why choose just one blossom, when you can have the whole bouquet? The pan-botanical Flora comes from the Latin word for flower, and a minor Roman goddess of all things spring answered to the name. Despite the popularity of Cora and Nora, Flora remains outside of the current US Top 1000 – at least for now. The famous city – called Firenze in Italy – is considered the birthplace of the Renaissance, and it has the art and culture to back that up. The first famous bearer of the name, Florence Nightingale, was named for the Tuscan capital. But Florence brings to mind all things green and growing. In fact, it comes from the Latin word for flourishing, making this another pan-botanical worth consideration. Gemstone names can feel perfectly vintage, like Ruby, or dazzlingly modern, like Diamond. Garnet feels a little more on the vintage side, I think – a century ago, it regularly appeared in the US Top 500 for girls. Red is the color inspiring so many girls’ names today, so this January birthstone might be perfect for parents after a similar-but-different choice. George and all his cousins come from the Greek word georgos, meaning farmer, or literally, earth-worker. It’s a humble and storied meaning, and has been used for centuries. 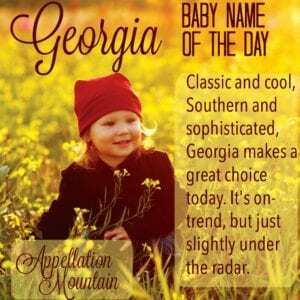 Georgia, the logical feminine form, has never left the Top 1000, and ranked in the Top 100 around the turn of the twentieth century. Up until the 1950s, Georgie was also popular as a girls’ name. Today it might make a great substitute for Charlie, an ecovintage choice with a sassy, retro vibe. Read more about Georgia here. Fueled by The Fault in Our Stars and plenty of celebrity children, Hazel has gone from obscure to the very heights of fashion. It’s proof that ecovintage is a trend with considerable power. If you think #52 is popular, it reached as high as the Top 20 in the 1890s – and might be headed back there again. It’s tailored and feminine, vintage but fresh – a thoroughly appealing choice. Read more about Hazel here. Once dismissed as poisonous, today Ivy makes for a mini name on the rise. It has all the style of Top Ten favorite Ava, plus ties to the winter season, and the prestige of Ivy League universities. I suspect this is among the ecovintage girl names headed towards the top of the popularity charts. For now, though, it might make a sharp and stylish – and just slightly unexpected – choice for a daughter. There’s something staggeringly elegant about Iris. Maybe it’s the ties to women of accomplishment, like Iris Murdoch and Iris Apfel. Or maybe it’s the flower itself. A handful of modern uses, from Judd Apatow’s young daughter, an actor herself, to Iris West from The Flash, currently played by Candice Patton in The CW version of the show. (Kiersey Clemons is set to play her in the 2020 movie starring Ezra Miller in the title role.) And, of course, the Goo Goo Dolls’ haunting song “Iris” comes to mind, too. In Roman legend, Iris was the goddess of rainbows, yet another appealing tie. Juniper leans modern, but June? It’s a sweet, summery name with a vintage feel. Popular in the 1910s, 20s, and 30s, June once belonged to figures like fictional June Cleaver, mom to Beaver on Leave It to Beaver, and Hollywood’s June Allyson. After hibernating through the 1990s, June is slowly being rediscovered. As straightforward as Jane, with as much seasonal luster as Summer or Sunny, this name has potential. What’s with the spelling change? It turns out that Lillie – this spelling – topped the charts from the 1880s into the 1920s, while Lily languished farther up the charts. Lillian was more popular than either spelling back in the day – but presumably a great many Lillians answered to Lillie, too. On the downside, Lillie feels familiar, no matter how you spell it. (Lily names are huge!) But there’s something sweetly antique, and yes, ecovintage, about this version. I’ve yet to write about Lillie, but you can read more about Lily here. Luna feels like a new discovery, bolstered by a Harry Potter-heroine and celebrities from Penelope Cruz to Chrissy Teigen. But way back in the late nineteenth and early twentieth centuries, Luna ranked in the US Top 1000. It was the age of Lou and Lu names: Lucy, Lucille, Louise, and Lula all made the Top 100. Today the name feels vibrant and modern, and instantly brings to mind the moon. But this is no modern discovery. Mae appeals for all the same reasons June does, though the merry month of Mae feels more like springtime than summer. But there’s a twist: Mae, especially this spelling, evolved as a pet form of classic girls’ names like Mary and Margaret. Spell it May, and it’s more clearly borrowed from the calendar – but also less common. Edith Wharton used May for her Age of Innocence character; but it’s Mae that belongs to Hollywood legend Mae West, as well as the baby girl in The Help, Mae Mobley, and Madonna’s character in A League of Their Own. Read more about Mae here. Magnolia seems poised to be more popular than ever in the twenty-first century, but this floral name had a good run from the 1880s into the 1930s, too. 1927 musical (turned 1951 movie) Show Boat told the tale of young Magnolia “Nolie” Hawks, but the name’s use pre-dated the tale. It’s often identified with the American South – think Steel Magnolias – so that may explain some of the name’s long history of use. Maisie rhymes with Daisy, but that’s not all. This Scottish diminutive for Margaret means pearl. 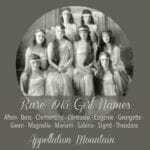 After all, the Greek margarites – pearl – is the origin of Margaret, and all the related names, from Greta to Margot. As for Daisy, the flower has long been associated with Margaret, because Marguerite is the French form of the name – and the French word for daisy. So that’s two mightily appealing nature name ties for this sweetly vintage name. Read more about Maisie here. Mavis means “song thrush,” and the avian named was popularized by an 1895 novel. 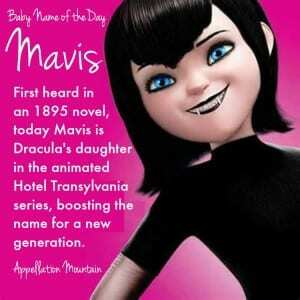 But it’s back today because of the adorable young vampire at the heart of the Hotel Transylvania animated series. On the big screen, she’s voiced by Selena Gomez. Ever since the first installment was released in 2012, parents have been warming to the antique appellation. With the third movie due out in summer 2018, that’s likely to continue. Read more about Mavis here. Maybe this flowering evergreen isn’t quite ready for a comeback. But it’s quite pretty, and has been a part of gardens since at least the days of ancient Rome. It’s traditional in royal wedding bouquets, thanks to Queen Victoria. 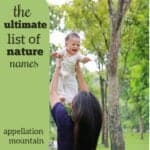 And with similarly tailored nature names like Hazel and Olive on this list, Myrtle might fit in nicely. I’ve yet to write about Myrtle. Check back and I’ll update when I do. Olivia is the chart-topper, the literary name with unstoppable appeal. Back in the 1890s, it was Olive that outpaced the more romantic Olivia. Today Olive has quietly made a comeback, thanks to a handful of positive associations. Drew Barrymore voiced a dog intent on saving Christmas in 1999’s Olive, the Other Reindeer, then named her first daughter Olive in 2012. It’s an anagram for “I love,” as pointed out in 2010’s Easy A, starring a young Emma Stone. And, of course, there’s Popeye’s girlfriend. All of it makes for a name that’s just slightly unexpected and thoroughly ecovintage. Read more about Olive here. October’s birthstone has been overlooked for girls in recent decades. But it was a favorite in the early 1900s, briefly reaching the Top 100. It comes from a Sanskrit word meaning jewel, which makes it rather glittery. And yet the sound is down-to-earth, simple and straightforward. With names like Alice and Evelyn back in favor, Opal seems like a promising possibility. Read more about Opal here. 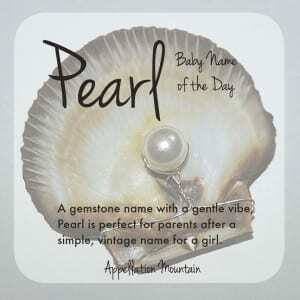 Pearl seems rather ladylike, a refined nature name rich in symbolism. Thanks to its ties to the ocean, and because it’s the birthstone for June, Pearl seems slightly summery. It’s the daughter’s name in The Scarlet Letter, and there’s Pearl S. Buck, too, which makes it literary. In the US, Pearl regularly ranked in the Top 100 into the 1920s, but it spent years languishing in obscurity, reserved for comic characters like Hee Haw’s Minnie Pearl. Now a new generation has rediscovered the simple loveliness of this enduring name. Read more about Pearl here. I could include so many of the Rose names here: Rosalie and Rosamond and Rosemary, too. They all relate to the flower, one that’s been inspiring parents for ages. Or not. The Ros- of many of the older names actually comes from the Germanic hros – horse. Happily that’s a nature name tie, too. We’ve long thought of this name as belonging to a different era – Rose was one of The Golden Girls and Kate WInslet set sail as Rose on Titanic in 1997, and plenty of us know a Rose – it ranked in the US Top 1000 through the 1950s. But now all of that marks it as vintage, and ready for use today. Parents have embraced it as a middle, and are reclaiming it as a first, too. I’ve yet to write about just Rose, but check back and I’ll update when I do. Vibrant and brightly red, Ruby is the color of July’s birthstone and Dorothy’s slippers. Until recently, it was also firmly in grandmother territory. But it reversed course in the 1990s, and this gemstone name now feels delightfully vintage and perfect appropriate for a girl born today. Short, nickname-proof, and found in oh-so-many song titles (from BB King to Kenny Rogers to Rancid), Ruby sets the ecovintage girl names style. The bookend to Luna, Stella means star in Latin. Famously yelled by Marlon Brando in A Streetcar Named Desire, Stella feels dramatic and colorful, a short name with spirit to spare. Like many of the ecovintage girl names, Stella started climbing in the 1990s, and reached the Top 100 in 2010. The 1993 children’s book Stellaluna, about a bat, might deserve some credit. Designer Stella McCartney’s career started in the 1990s, too, lending the name some high fashion cred. Or maybe it’s just another of the many -ella names that has won our hearts. Read more about Stella here. Neither spelling of this traditional, ecovintage name makes the current Top 1000. That’s a surprise – and an opportunity! The -a spelling has seen more use, though both previously made the US Top 1000. (And, of course, spare Susan soared to the very top of the charts.) Because they come from the Hebrew word for lily (or maybe rose), the ties to the natural world are clear. As elaborate as Isabella, Susanna – with or without the h – sounds both romantic and traditional. Read more about Susannah here. A newcomer to the US Top 1000, Sylvie technically shouldn’t make this list. It’s Sylvia that peaked from the 1930s into the 1950s. But because Sylvia made it into the Baby Boomers’ generation, it might not feel quite antique enough for rediscovery. Instead, it’s Sylvie that has become the white-hit ecovintage pick of the moment. 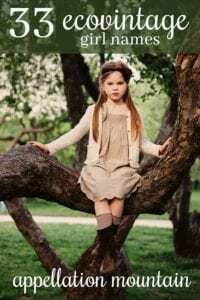 Coming from the Latin word for forest or woods, Sylvie and Sylvia are cousin to Silas and Sylvester, ecovintage boy names that we’ll explore in another post. One of the ill-fated children from Charlie and the Chocolate Factory. The Dowager Countess of Grantham on Downton Abbey. The eldest Parr kiddo in The Incredibles. So many memorable characters have answered to this name. 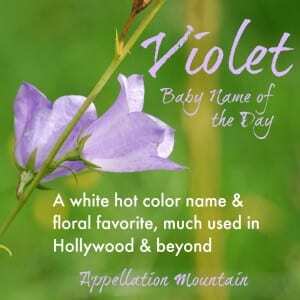 A straight-up botanical choice, Violet was the height of fashion from around 1900 into the 1920s. But the name is even more popular today, propelled by that sharp V sound and a feminine, but frills-free style. If you’re after something that reads traditional, but distinctive, colorful Violet stands out farther than staples like Elizabeth and Katherine. Read more about Violet here. 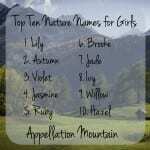 What would you add to this list of ecovintage girl names? Are there any that you would consider for a daughter? THIS is my category of names! 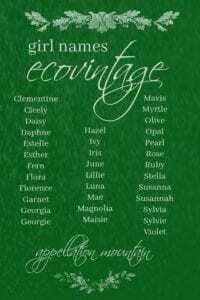 Our selected girl’s name, Iris, is on there – now I just need an eco vintage boys name list to help pick a boy’s name! If I were naming my twins today, I could see us using Daphne and Georgia instead. I have read this post a dozen times! I think ecovintage names are my sweet spot. Lately, we’ve been leaning heavily toward Ruby, but I adore Rose, Fern, Hazel, June, Olive, and Iris. I absolutely love Opal, Silvia, Luna, Iris, Estella, and Esther! And I’m fond of many other names on this particular list like Fern and Clementine. I love Myrtle, Opal, and Pearl! Fern and Hazel are my favourite F and H names! Without looking at rankings at all, it strikes me that Clover would sit well on this list. 2. There is no Baby name of the Day about Rose! I looove this category and list!! Many of these were on my list for my children (and still are if we have another) ;)…. Antother vintage/nature name is Jemima. It means Dove. It’s more popular in the UK but very rare here in the US. I know it has the syrup connection…. but I think it’s just lovely and clunky-vintage like Clementine. Again- love love this list. Thanks!! I love Jemima, but I don’t know that it will ever be usable in the US. I love this category. Perhaps with Susan in grandma territory in a few more years we’ll start seeing Susanna(h) being used again to honor them.